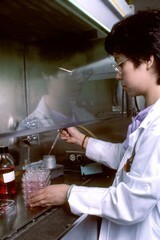 Seen is an Asian female lab technician performing a step in the estrogen receptor assay. She is placing some liquid in test vials and inspecting them. In some slides only her hands and the vials are visible. The results of this test indicate whether removal of ovaries or antiestrogen drugs is the likely therapy.